Johannesburg - The European Tour season will reach its climax with the staging of the DP World Tour Championship in Dubai at the Jumeirah Golf Estate on Thursday. The Race to Dubai spans 47 tournaments in 26 countries across four continents. It is a season-long competition to crown the tour’s best player. The race is contested by 60 golfers and determines a bonus pool, which goes to the golfer with the most points after the championship. Formerly known as the Order of Merit, points are accumulated based on prize money won, with the top 10 ranked players at the end of the season sharing a $5 million (R72 million) Race to Dubai bonus pool. England’s Tommy Fleetwood is currently leading the chart. He stands a good chance of winning this year’s race by virtue of having amassed the most points. He is competing at the Nedbank Golf Challenge that finishes at Sun City on Sunday. This is his 23rd event on the tour. Having scored a huge chunk of points when compared with other contestants in the race, the Englishman is on the cusp of victory. He won two European Tour events this year – the Abu Dhabi HSBC Golf Championship in January and the HNA Open de France in July. 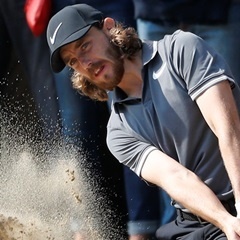 Fleetwood’s top-10 berth on the rung gives him the edge on the table that is dominated by fellow English players in the mould of Justin Rose (second), Tyrell Hatton (fifth) and Ross Fisher (sixth). Rose is about to finish the season in superb fashion following two back-to-back wins at the WGC-HSBC Champions at Sheshan Golf Club in Shanghai, China, a fortnight ago and the Turkish Airlines Open at Regnum Carya Golf & Spa Resort, Antalya, Turkey, last Sunday. Rose is not in the Sun City field as he is preparing for the Dubai showdown. With the Tour Championship looking set to attract a strong and competitive field by virtue of being the deciding factor of who will win the race, competition is likely to be stiff. Last year’s race was won by Sweden’s Henrik Stenson after a brilliant final round at Jumeirah confirmed his status as Europe’s number one following a season in which he became Sweden’s first major kingpin at the British Open. But pointers are that Fleetwood will most probably win the race by virtue of having collected the most points.